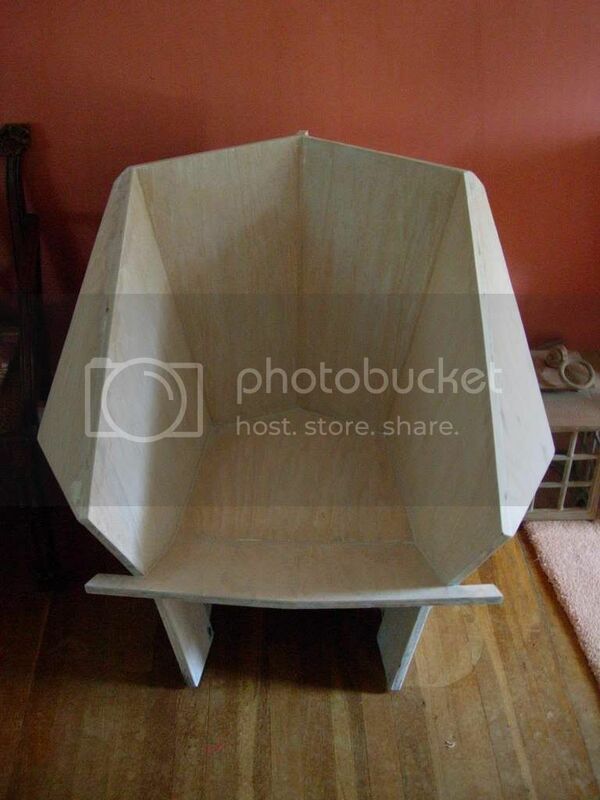 I am refinishing a vintage origami chair. The chair had been painted terribly and has been quite a task to strip. There are so many surfaces. My issue is that I have the chair but no upholstery. If anyone has a plan or diagram for the cushions and the fabric and would share, I would greatly appreciate it. All I have are photos of various versions of the chair. Note the differences in construction and detail. The angle of the front edge of the arm varies widely. Some but not all later versions have anti-tip front feet. The Sturges example(s) lack the front seat panel notched extensions, rear top extension, rear vertical member, side upholstery and metal feet. 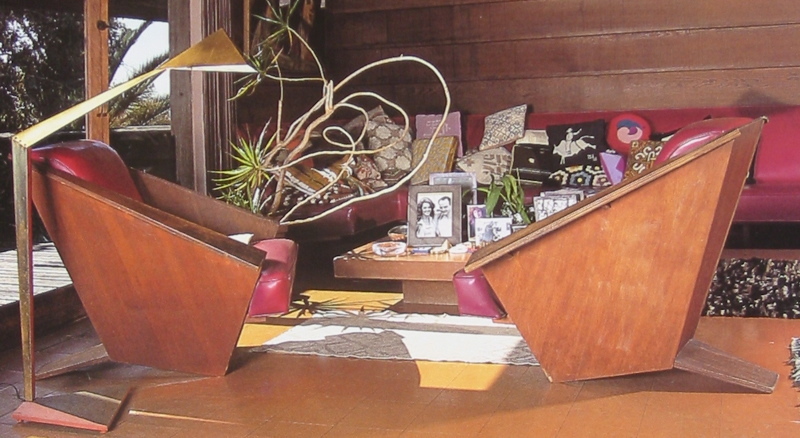 In the Cassina photo, floor shadows have been included in the construction (!). A fabric drop at the rear of the Korab photo -- and front feet ? -- may or may not have been cropped accidentally. . . Thanks for the update and the photos. I have been feeling guilty about 'my' origami chairs, but to see so many different ones has rather eased my conscience, as they are all so unique. When I took mine to the upholsterer he had me make 1/4" ply templates to fit inside each upholstered surface, which he then covered in padding and leather as specified. 1/2" on each side, 2"on the back and a 6"seat with the foam cut along the same angles as the sides. I rather liked the exposed wood at the top of the back so we left that alone. The anti tip front feet have helped version two immensely. Thanks for the insight. One other question. 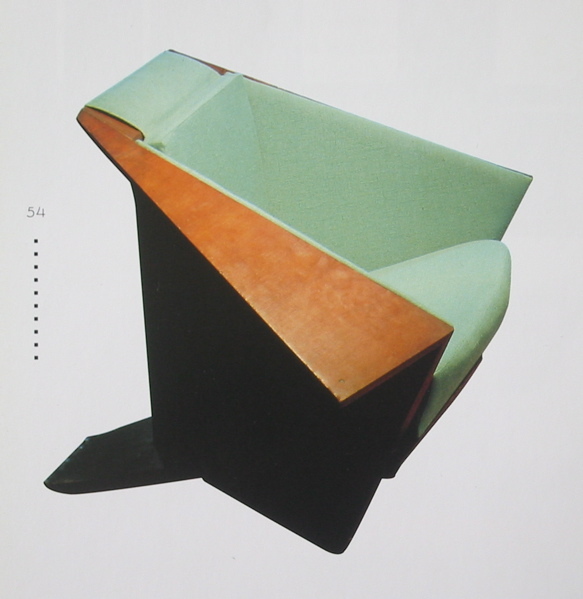 How was the 1/4" attached to the insides sides of the chair? Was it Glued in place and do you know what they used? I have seen drawings of dining chairs with screw applied snaps that are attached to the frame and the upholstery attached to that, but on this application we didn't want to mar the wood so much, so we used velcro. It is easier to attach and holds well without the very precise allignment required for the snaps. On the first chair the upholsterer used gimp nails right though the open weave fabric with the sides holding the back in place. the seat cusion was loose. We like the velcro much better for cleaning as well. I've never actually examined an original origami chair, they've all been much too precious. Posted: Mon Jul 16, 2007 4:18 pm Post subject: Thanks! We had considered the Velcro but wanted to get the opinions of those with experience. Is your chair made in such a way that the back creates a sort of bucket and if so did you cut the seat foam to take up that space? If there's a choice about how to shape the foam for the back, I would consider choosing the most comfortable shape, thickness and firmness of foam; later restorations can always revert to the most original version (if that can be determined). This assumes you intend to use the chair, not place it on display. . .? I intend to use it everyday! I agree with you about function here. I want to do a good job so that it closely follows originals. The back of this chair is unique from the others I have seen and me present a unique opportunity to shape the back. I wasn't myself aware of how much the different Origami examples varied, until I collected the images above. Does yours have a V-shaped back ? Is the back made of two panels that meet in a central vertical joint ? Is there a central "fin" like the one in the first photo ? I'm trying to imagine the "bucket" you mention. . .
makes the foot seem shorter in the back when in fact it actually creates more room in the chair. I was considering continuing some of the v shape in the cushions in the back. I have not been able to find a photo in any of my books showing this set up. The bottom starting at the Foot and working upward runs beneath the back at the traditional angle but meets another piece that is the front of the bottom appx. 8 inches before the front of the bottom. This piece that completes the bottom of the seat is at a different angle than the rest of the bottom creating a slight drop front to back at the 8" point where the rest of the seat is deeper than the front. We tried the seat both ways with the foam cut so the seat was level, ending with 6" in the front and the second version with the seat 6" all the way reflecting the actual shape of the chair. We like the second version better and it seems to wear better too. Did you try also cutting the back thicker at the bottom and thinner at the top on the back? 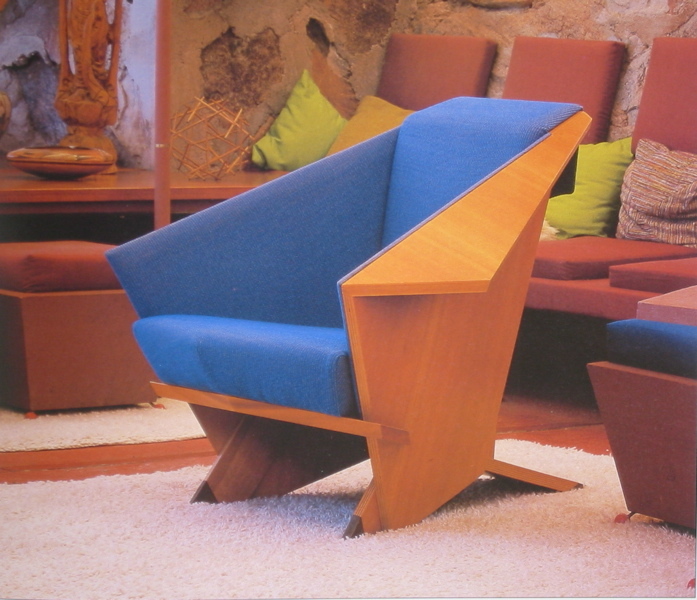 Is anyone aware of any firms which sell plans to building this chair for oneself (not commercially)? 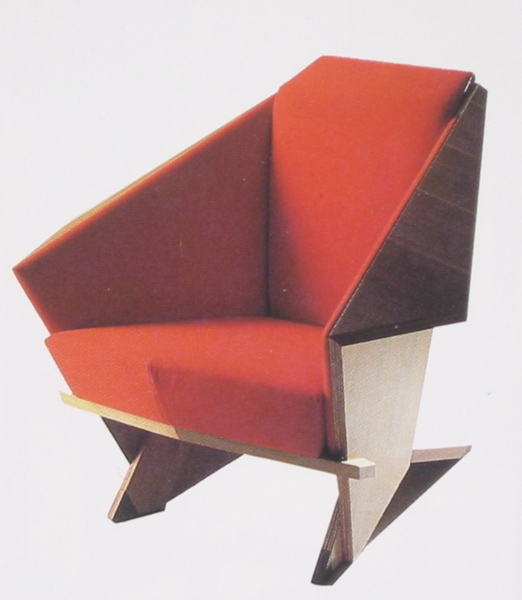 Here's another Origami Chair, apparently in the Rubin Usonian (1951). 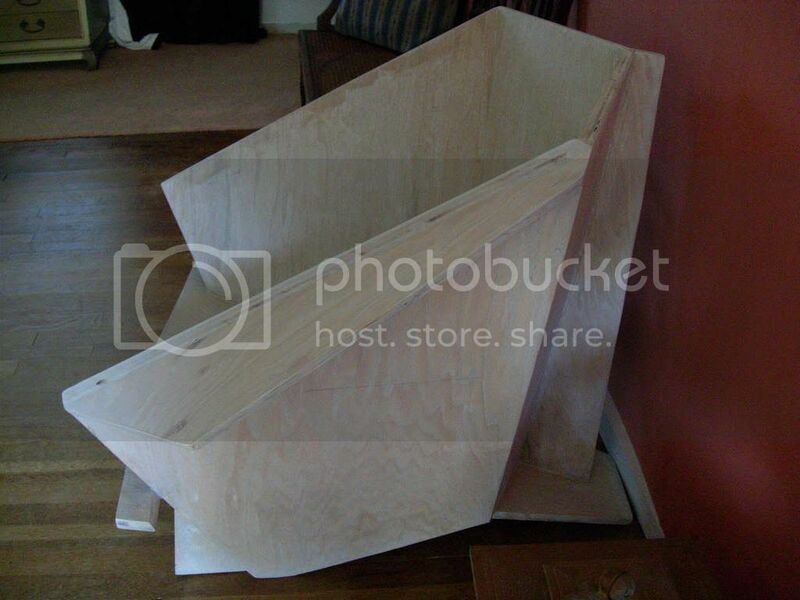 Posted: Tue Aug 14, 2007 5:59 pm Post subject: My Chair So Far! I have completed the huge task of stripping the terrible paint job. It was a massive undertaking. The paint did not go easily. I am sharing photos of my chair because the back and the seat are so different from the other photos. Does anyone have additional thoughts before I continue to the finish and upholstery?